Click on the bars below to all the subdivisions and condo & townhome complexes in Highlands Ranch. You can also view the most popular searches such as ranch style homes, new construction, homes with a pool or houses with mountain views. Click to see Local Subdivision and Complex Maps. What is Your Highlands Ranch Home Worth? Highlands Ranch, Colorado, is a beautifully designed, master planned community founded in 1981. Here, you will enjoy a top-notch quality of life, access to the wilderness, amazing amenities and gorgeous homes. Located 12 miles south of Denver, Highlands Ranch is a city bursting with opportunity. The town is broken into four main subdivisions: Northridge, Eastridge, Southridge, and Westridge. In each of these areas, you will find smaller sub-areas your family can call home, knowing that Highlands Ranch home values are great in every location. The Backcountry subdivision is a high-end community built on the principle of land stewardship and balancing open space, recreation, public facilities, and wildlife habitat. That means that when you make your home here in one of the 950+ residences in the community, the Backcountry Wilderness Area and its 460 acres of flora and fauna is part of your neighborhood. Falcon Hills is another prestigious, gated community in Highlands Ranch, voted as one of the top ten best master planned communities in the USA. You are never too far from nature with stunning mountain views as well as walking trails and a park within the gates of Falcon Hills. Tresana and Verona Townhomes offer similar luxury without the yard maintenance. Golfers will be happy to hang up their clubs in a home at Gleneagles Village, or the Highlands Ranch Golf Club community. Whatever your lifestyle, homes for sale in Highlands Ranch, CO will put you in the perfect locale to pursue your goals. 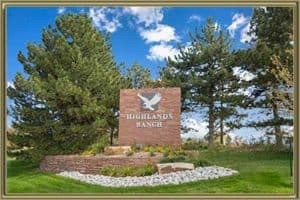 Buying one of the many homes for sale in Highlands Ranch, CO will make you a member of a vibrant and exciting community with many features and attractions. Dig into a community garden and enjoy the literal fruits of your labor. Highlands Ranch has three community gardens, all of which feature organic soil and a fenced plot. For another kind of nature adventure, take one of the Highlands Park trails into Bluffs Regional Park, a 253-acre wilderness area with trails for cyclists, equestrian use, and hikers. Visit the Highlands Ranch Mansion for a free tour of one of Colorado’s early settlements. The mansion was long home to big names in local history, and now functions as a way to step back in time in Douglas County.See a complete list of attractions and things to do in Highlands Ranch. The best way to learn more about this region and its highlights is to work with a Highlands Ranch real estate agent who knows the ins and outs of the community. We know all there is to know about Highlands Ranch, from home values to its subdivisions, schools, public facilities, and places to play. Our real estate agent will create a free personalized market report to help you understand how the local real estate market is trending, including what has sold, for how much, and the best properties remaining on the market. You can also view our Highlands Ranch maps to see where each subdivision and complex is located throughout the town! Thinking about selling your home? Get your Highlands Ranch Home Value Instantly Online. Whether you are selling your home in Highlands Ranch or you are only thinking about it, we can help. Learn your Highlands Ranch home value instantly online by speaking with our local agents. Our team gives you a detailed home value figure, with pre-listing advice and a staging consultation. Our real estate agents will also help you find out where your home sits compared to the rest of the market with our online search tools, market trend reports, and market updates. The Gold Compass Real Estate team, headed by Mike Lies, is here to provide home guidance you can trust, whether you are buying or selling. Our specialty is local real estate, including Highlands Ranch and the Denver Metro area. Check out the up-to-date listings on our user-friendly site or call Gold Compass Real Estate at 303-325-5690.